Electric Paramotor VS Gas: Which is the best for you? Paramotor mistakes: Learn from my errors! 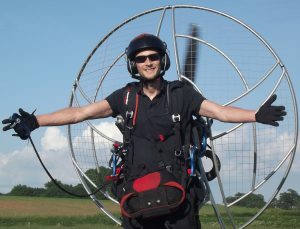 why are paramotors so expensive: Are we being ripped off? Fairhaven Micro Alti Vario Review – More than just an altimeter! Paramotor rules and regulations are pretty relaxed compared to many other forms of aviation. But before taking flight it's important to fully understand basic air law and the rules of the air. These flight rules have been put in place for your safety and for the safety of others in the air and on the ground. Know the law and follow it! Since I began flying I've seen many people abuse these rules taking the freedom of our sport for granted. I've read numerous complaints and watched countless videos of paramotor pilots flying like absolute A-holes! This could ultimately lead to paramotoring being more tightly regulated, meaning we'd have to obtain a license, carry transponders, display wing registration numbers, etc. This sport is amazing and our freedom is precious, don't waste it or treat it carelessly for a quick buzz. Before every flight you will need to check the NOTAMS for the area you plan on flying over. A NOTAM is a notice to airmen which can be issued for many different reasons. They are typically issued when there may be some kind of hazard to aircraft, for example a firework display. You'll see a description of the hazard, in this instance it's balloon or kite flying, and the NOTAM covers a 1 nautical mile radius. You can see the location and the maximum height that the balloons/kites will be flying. You can also see the date and time that you should be aware of the hazard and a number to call for more information. You can use websites like the NOTAMinfo.com and the Federal aviation administration to check NOTAMS near you. The picture below shows how many NOTAMS are in place in the UK at the time of writing this article. There are hundreds and some of these restrict any type of flying, so you can see why it's so important to check. These aren't mandatory flight rules but in an effort to avoid tighter regulations you should be wary of people/animals on the ground. You should avoid causing a noise nuisance or annoyance at all costs. Repeatedly flying over property or taking the same flight path every flight could really annoy the locals. Remember, being a noise nuisance could also result in a large fine. You should also avoid flying low over bird sanctuaries and protected areas. Be mindful of livestock like cows, sheep, and horses as they can get very freaked out by paramotors. If you're taking off from a field check that there are no horse riders in the vicinity. If there are, wait until they're well clear of the field before launching. You should always obtain permission from the land owner before launching from any privately owned field. Check for dangers like hidden holes, trees, and power lines, and turn away from the owners property immediately after launch. Rules of the air regulations section IV states that weather reports should be examined immediately before every flight. You should check reports for the area in which you'll be flying, from takeoff until your planned landing time. Remember, weather forecasts are good but they can be wrong from time to time. If the conditions feel too strong to fly your paramotor then don't attempt to launch just because the forecast looks good. Use websites and weather apps like Windfinder and XCweather to get a good weather prediction for your area. A preflight inspection of your paramotor and wing should be made immediately before every launch. It's your duty to ensure the machine is in perfect airworthy condition and will not cause a danger to yourself or anybody else in the air or on the ground. Many aircraft are required to pass regular inspections of airworthiness to ensure they're safe to fly. Paramotors don't fall into this category, but you should send your wing off every 100 hours for an inspection. You can send your wing to somewhere like the loft for servicing and inspection. They'll run porosity tests, check line strength etc, and they'll also repack your reserve parachute. Low level flying is great fun but it must be done in accordance with rules of the air regulations section II. This states that an aircraft shall not fly closer than 500 feet to any person, vessel, vehicle or structure. This is measurable in any direction for example horizontally or vertically. The only time this flight rule can be ignored during paramotor flights is whilst taking off or landing. This rule can also be ignored by paramotor or glider pilots that switch their engine off while hill-soaring. An aircraft shall not be flown below such height as would prevent it making an emergency landing without causing danger to persons or property on the surface in the event of an engine failure. Section II also states that you shall not fly over any congested area of a city, town or settlement below a height of 1500 feet above the highest fixed object. You must also maintain enough altitude to glide clear of the congested area and land safely in the event of an engine failure. Section IV. An aircraft which is flying within the United Kingdom in sight of the ground and following a road, railway, canal or coastline, or any other line of landmarks, shall keep such line of landmarks on its left. If you find yourself approaching another aircraft head-on, both aircraft should steer right to avoid a collision. To remember this rule memorise the phrase - on the right, in the right. If you're overtaking another aircraft, the aircraft which is being overtaken shall have the right-of-way. The overtaking aircraft shall keep out of the way of the other aircraft by altering course to the right. An unpowered glider overtaking another glider in the United Kingdom may alter its course to the right or to the left. Gliders shall give way to balloons. When two aircraft are converging in the air at approximately the same altitude, the aircraft which has the other on its right shall give way. Mechanically driven aircraft shall give way to aircraft which are towing other aircraft or objects. Section II (5D). You shall not fly over, or within 1000 metres of any event in the open air of more than 1000 persons assembled for the purpose of witnessing or participating in any organised event. The only time this is permitted is with permission in writing from the CAA. And in accordance with any conditions therein specified and with the consent in writing of the organisers of the event. You shall not takeoff/land within 1,000 metres of an organised open-air event/assembly of more than 1,000 persons. Except at an aerodrome, or at a landing site other than an aerodrome, in accordance with procedures notified by the CAA. You must also obtain written permission from the organiser of the assembly. Section IV. You shall not practice aerobatic manoeuvres over a congested area of any city, town or settlement, or within controlled airspace. If you want to practice wing overs, spirals, or any other manoeuvre do it no lower than 1500 ft over clear fields. Visual flight rules (VFR) are a set of regulations under which a pilot operates an aircraft in weather conditions generally clear enough to allow the pilot to see where the aircraft is going. Specifically, the weather must be better than basic VFR weather minima, i.e. in visual meteorological conditions (VMC), as specified in the rules of the relevant aviation authority. The pilot must be able to operate the aircraft with visual reference to the ground, and by visually avoiding obstructions and other aircraft. 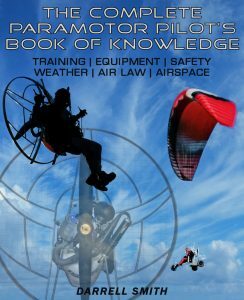 These rules relate to paramotors flying in class G airspace. The five classes of airspace are explained in the airspace section further down the page. 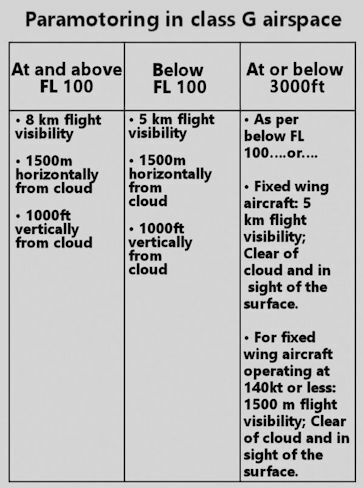 Section V. Aircraft flying at or above flight level 100 (10,000 ft) shall remain at least 1500 metres horizontally and 1000 feet vertically away from cloud. You shall always maintain a flight visibility of at least 8 km. If you're flying below flight level 100 you should maintain at least 5 km visibility. VFR flight cannot be conducted at nighttime. Night means 30 minutes after sunset until 30 minutes before sunrise at surface level. So assuming your paramotor has no beacons fitted you must only fly during daylight hours. 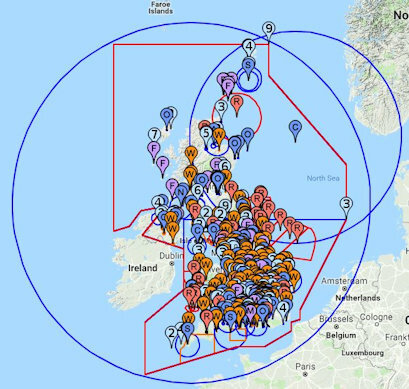 In the UK there are currently five classes of airspace; A,C,D,E and G. The classification of the airspace determines the flight rules which apply and the minimum air traffic services which are to be provided. Classes A, C, D and E are areas of controlled airspace and G is uncontrolled airspace. Controlled airspace is provided primarily to protect its users, mostly commercial airliners, and as such, aircraft which fly in controlled airspace must be equipped to a certain standard and their pilots must hold certain flying qualifications. Pilots must obtain clearance from Air Traffic Control (ATC) to enter such airspace and, except in an emergency situation, they must follow ATC instructions implicitly. Class A. In class A airspace, only Instrument Flight Rules (IFR) flying is permitted. It is the most strictly regulated airspace where pilots must comply with ATC instructions at all times. Aircraft are separated from all other traffic and the users of this airspace are mainly major airlines and business jets. Class C. Class C airspace in the UK extends from Flight Level (FL) 195 (19,500 feet) to FL 600 (60,000 feet). Both IFR and Visual Flight Rules (VFR) flying is permitted in this airspace but pilots require clearance to enter and must comply with ATC instructions. Class D. Class D airspace is for IFR and VFR flying. An ATC clearance is needed and compliance with ATC instructions is mandatory. Control areas around aerodromes are typically class D and a speed limit of 250 knots applies if the aircraft is below FL 100 (10,000 feet). An aerodrome is a location from which flight operations take place such as large commercial airports, small General Aviation airfields and Military Air Bases. The term airport may imply a certain stature (having satisfied certain certification criteria or regulatory requirements) that an aerodrome may not have. So whilst all airports are aerodromes, not all aerodromes are airports. Class E. Class E airspace is for IFR and VFR use. IFR aircraft require ATC clearance and compliance with ATC instructions is mandatory for separation purposes. VFR traffic does not require clearance to enter class E airspace but must comply with ATC instructions. Class F. Class F airspace was removed in 2014 and returned to class E or G.
Class G. In class G airspace, aircraft may fly when and where they like, subject to a set of simple rules. Although there is no legal requirement to do so, many pilots notify Air Traffic Control of their presence and intentions and pilots take full responsibility for their own safety, although they can ask for help. Air Traffic Control can provide pilots in Class G with basic flight information service to support their safe flying. An Alerting Service is also provided if necessary to notify appropriate organisations regarding aircraft in need of assistance (e.g. search and rescue). These easy to follow flight rules should be practised during every single paramotor flight. Don't be the one that ruins the sport for the rest of us by breaking them and getting reported. Following the rules will not only protect our sport and the amazing freedom we have, but it will make flying safer for yourself and protect others around you. 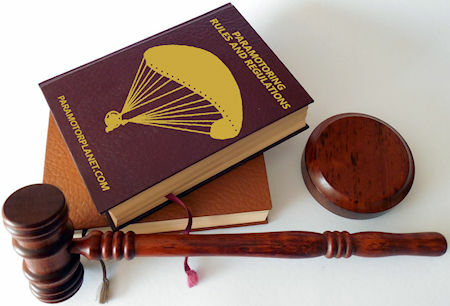 Ready to find out more about paramotoring? Find out how to start flying HERE. I started Paramotor Planet to share everything I know about this amazing sport. This site has now become the top resource for pilots all around the world. I live in the UK, where I’ve been paramotoring at every opportunity since 2013. Read more.